Note: Based on a Japanese manga of the same title. The manga author is Hideaki Sorachi. Where to watch: Official DVDs, Crunchyroll.com (subbed). Countries/Regions of Popularity: The Philippines, Singapore, Thailand, Indonesia, Malaysia. 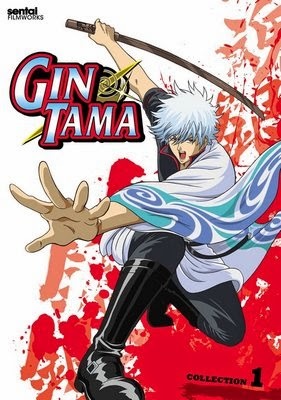 Synopsis: Former rebel samurai Gintoki Sakata and his two young apprentices, Shinpachi Shimura and Kagura, run an odd jobs business called Yorozuya. Whether intentional or unintentional, they always seem to stumble upon intrigues involving dangerous elements like the Shinsengumi (Endo's reckless police force), anti-government groups, the Yakuza, aliens and ninjas. While the group may look like a goofy bunch, they share an unshakable bond not just with each other but also with the people around them. Story/Direction: For a series with over 300 episodes, fillers are something unavoidable. Fortunately, there are few fillers in Gintama because its original content is probably 70 percent parody. Each episode is filled with references to otaku and Japanese culture. If you are not aware of the parodies, you won't be able to enjoy Gintama as much. The serious arcs in this series are among the best in the action genre. The storytelling in these arcs is superb and the actions are intense. Fans of action anime will love this series. Animation: The visuals in Gintama range from barely adequate to amazing. Considering the large number of episodes, this should not come as a surprise. The animation does improve over time however. The serious arcs in the series consistently enjoy top-notched animation. The fight scenes are especially well-animated, giving the viewers an epic feel. Music: Gintama featured a number of different opening and ending songs. Most of them were effective in setting up the mood for the series, though none of them stood out as memorable. My Favorite Character: Gintoki Sakata. Titular characters usually don't top the list of my favorite anime characters, because I often find them to be annoying rather than interesting. Gintoki is clearly an exception. The author Hideaki Sorachi managed to create a character that is neither too perfect nor too naive. His background story is also intriguing. My Favorite Arc: Yoshiwara in Flames Arc. This arc has everything that makes Gintama great -- intense fight scenes, an emotional storyline and unforgettable characters. Yoshiwara also introduces Kamui (Kagura's brother) who is one of the main antagonists in the later Gintama's arcs. There is hardly any room for a breather in this action-packed arc. Final Comment: Gintama is not a show that can be judged after watching a couple of episodes. The more you watch the more attached you are to this show. Your enjoyment grows with each new episode you watch until you become, frankly, addicted to it. This is the reason why the show is still on-going even after 300 episodes; its fanbase is growing by the day. It is quite unfortunate that Gintama is unlikely to be available to watch on American television, as I believe this series is one of the all-time top anime shows. Verdict: 4/5 (Serious action mixed with parodies of Japanese/pop culture).